It’s always amusing when someone as ignorant about technology as Andy Esquivel pretends to be a tech guru! It’s even more hilarious when someone of Andy’s technological ineptitude gets excited and starts showing off his ignorance to the world. 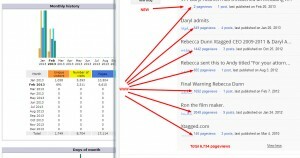 Several months ago, Andy Esquivel posted online charts showing the number of “requests” his various webstes were getting. Andy made the posts with much fanfare (devoting huge patches of real-estate on his homepage to the data) and each post was accompanied with varying proclamations to God and assorted Hail Marys and Amens. It almost broke my heart to have to reveal to Andy via a post on my Xtagged Scam thread that a “request” means nothing in the world of web analytics where I’ve made my living for the past two decades, and that every page on his various websites fired anywhere from 10 to 30 such “requests” every time a page was loaded. I explained that the tens of thousands of “requests” Andy was seeing on his various websites probably actually only translated into a few hundred real page views after bot traffic was discounted and his own views subtracted from the total. Now, I’m not going to break out the ruler and try to get into a “who’s bigger” contest with a sociopath. The fact is, it doesn’t matter how much traffic Andy’s websites generate vs. mine because we’re reaching different audiences. Andy’s websites are geared towards himself, his girlfriend, Allen Brady, and the few people in this world who haven’t yet figured out he’s nuts. My websites are geared towards people who would otherwise take Andy seriously and need to be warned to stay away. That said, I feel compelled to point out that our humble little Xtagged.co blog has generated 6,610 “real page views” this month alone…and the month isn’t even over yet. That number of course excludes 4,905 pageviews served to bots since February 1st. In other words, we’ve generated nearly as much traffic in the first two thirds of February than all of Andy Esquivel’s blogs generated in the whole of 2012 and for the first two months of 2013. In January Xtagged.co served 10,504 page views during the 5,393 visits made to the site by 1,058 unique visitors (real people). While those numbers pale in comparison to the 600k – 750k page views my old PartyUtah.com website served up every month and is nothing like the over 100,000 page views we served up on the last single day I owned the site, it’s still pretty good for a black and white blog that doesn’t advertise and for which I’ve done no promotion. In the end, traffic doesn’t mean a whole lot without what we call in my field “key performance indicators.” The key performance indicators of this website are the number of people who find us online and come forward with additional information, evidence, or horror stories about Andy Esquivel and his various scams and the number of months Andy spends in prison because of the evidence we uncover. By those measures, this tiny little corner of the Internet is doing pretty good. The new GaryTheBus.Blogspot.com blog, which only launched a month ago, has already generated 2,200 ‘real pageviews’ of traffic. Please note: that’s more than any of the blogs listed in Andy’s screen-shot…even the ones that launched over a year ago. 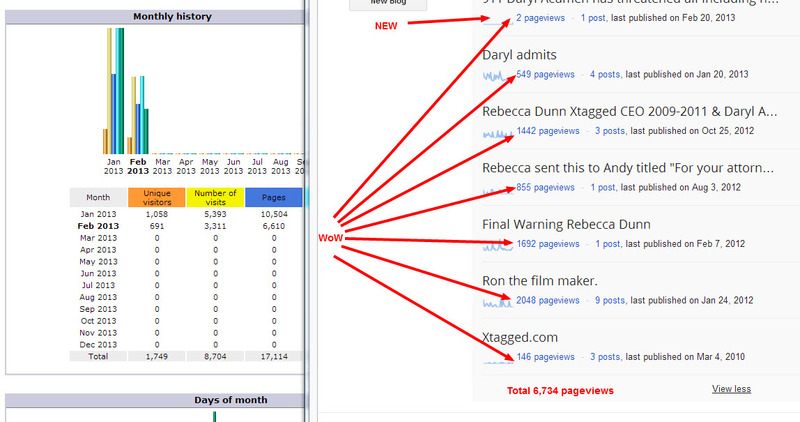 The most viewed blog of Andy’s was Ron the Film-Makers blog at 2,048, but it launched in January of 2012. Sorry Andy, what else you got up your sleeve?